Compared with the number of beaches in many other Cape Cod towns, Bourne beaches are somewhat few and far between. But when you're in Bourne and ready to cool off with a dip in saltwater, you'll find several lovely stretches of sandy coastline that are well worth a visit. At virtually all beaches in the town of Bourne, a town-issued vehicle parking pass is required. The only exception is Scusset Beach, a state-owned beach on the "mainland" side of the Cape Cod Canal. At Scusset, a daily fee or Mass. Parks Pass is accepted. The town of Bourne is pretty stingy with its parking stickers. And that makes beach parking a tricky issue for visitors. Visitors who are staying in Bourne for one week or longer. If you're a permanent resident, property owner, or long-term renter, you're golden. Buy a sticker, and you can park at any town-managed beach in Bourne. If you'll be staying in Bourne for one week or more, you're eligible for a temporary 1-week or 2-week sticker. However, your temporary sticker will be valid only at Monument Beach. So, your options will be: (1) buy the sticker to use at Monument Beach, then walk or bike to any other town beaches you'd like to visit; and/or (2) go to state-managed Scusset Beach and pay the daily parking fee. If you'll be staying in Bourne for less than a week, you're out of luck when it comes to parking at town-managed beaches. Your options are: (1) walk or bike to the beach; and/or (2) go to state-managed Scusset Beach and pay the daily parking fee. Where to Buy: Stickers are available at the Natural Resources Office at Town Hall, 24 Perry Avenue in Buzzards Bay. Proof of your residency/length of stay in Bourne is required to get a sticker. Click here or call (508) 759-0621, ext. 3, for more info. Important FYI: Parking stickers are required all year long! As of March 2017, the fine for parking illegally at Bourne's beaches has doubled. You'll now get hit with a $50 fine if you're caught parking without a sticker. (And yes, they do ticket illegally parked vehicles in the off-season, too.) Ouch!! Situated near the western entrance to the Canal, Monument Beach is a fun place to swim, relax in the sun, and watch boats coming and going from the adjacent marina. It's also a popular spot for windsurfing. The beach is large, has plenty of room and rarely feels too crowded. Mo Beach is kind of pebbly/shelly in spots. If your feet are especially sensitive, be sure to bring your flip-flops or beach shoes. Services: Lifeguards, snack bar, restroom and shower facilities, volleyball net, swim dock. Beach wheelchairs available in season. Call (508) 759-0613 for info. This state-run beach is part of the Scusset Beach State Reservation - a large, seaside state park is on the "mainland" side of the Cape Cod Canal. Scusset is a very long, pretty beach that begins near the eastern entrance to the Canal and extends nearly as far as the eye can see. The sand is soft, and the wave action is generally calm to moderate. This is a fantastic place for beachcombing, yacht-spotting, and surf fishing. In the summer, look for bluefish breaking the surface just off shore. Services: Lifeguards, restrooms and shower area, snack bar. Beach wheelchairs available in season. Call (508)866-2580 to reserve. 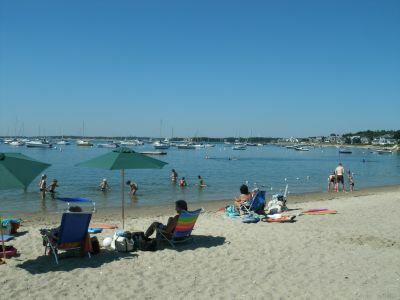 This is a small beach in the "downtown" area of Bourne. Electric Avenue Beach has nice sand and amazingly clear blue water. It has a playground for the kids, bike racks, and views of the nearby windmill, too. One of several beaches near the eastern entrance to the Canal, Sagamore Beach is also on the "mainland" side of the town of Bourne. Although I personally prefer Scusset for all the amenities it offers, Sagamore Beach is a perfectly fine place to spend time, too! In the quaint Bourne village of Gray Gables, this medium-sized beach has a small swimming area and nice views of boats in the anchorage just offshore. The water at this beach is warm and very calm. And at low tide, little "creeklets" form - great for small tykes to splash around in. Crowd Factor: A good amount of room to spread out, but not an especially quiet atmosphere during the busy season.